When I was a kid, we had a crab apple tree in our yard. 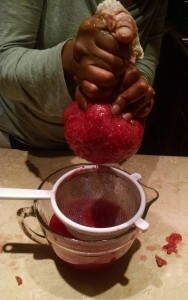 My mom used to make jelly using those crab apples. 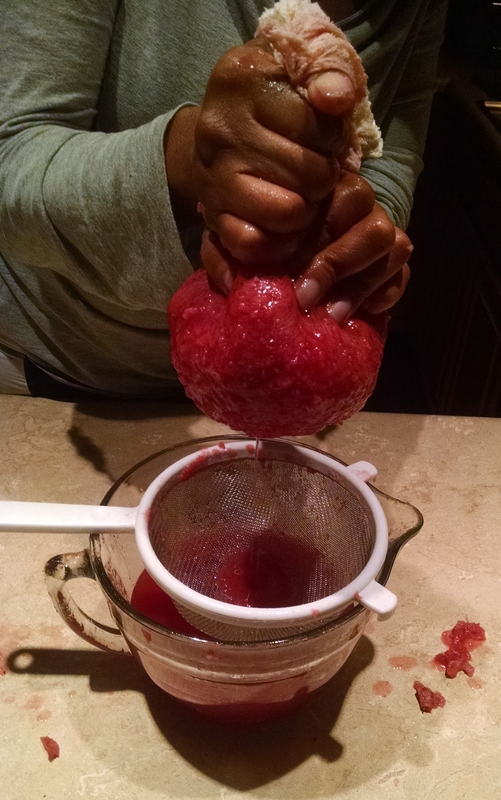 She made all kinds of jams, jellies and spreads. 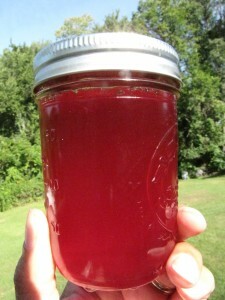 Crab apple jelly was my personal favorite. I’d never made it as an adult but having recently had a milestone birthday (the big 5-0! 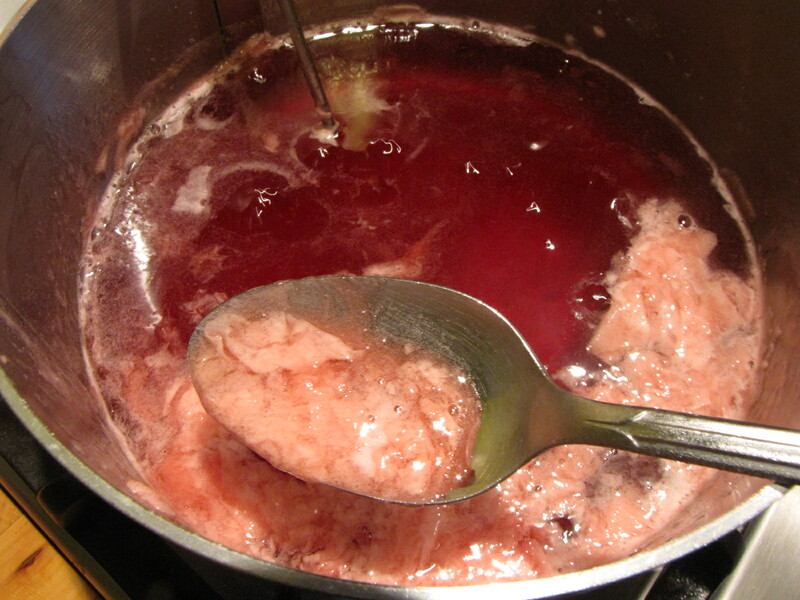 ), I’ve been feeling a bit nostalgic and decided to indulge my craving for crab apple jelly. The first challenge? Getting crab apples. Problem solved. 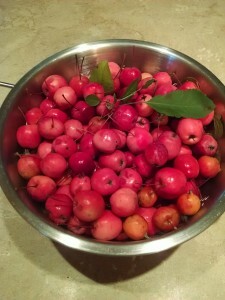 All I had to do was post on Facebook, ‘does anyone have some crab apples I can forage?’ My friend Hilary came through. Here’s how to make crab apple jelly. All you need is 4 cups of crab apple juice (about 3 pounds of crab apples and 3 cups of water) and 4 cups of sugar. 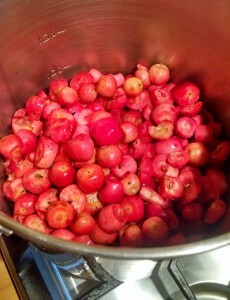 This is what 3 pounds of crab apples looks like. I like to pull the leaves and stems off the crab apples and cut off any bad spots. Then I place in a saucepan with 3 cups of water. Next cook until the crab apples are soft. To make the juice, you need to press or squeeze the crab apples. Cheese cloth and a fine mesh colander work really well. 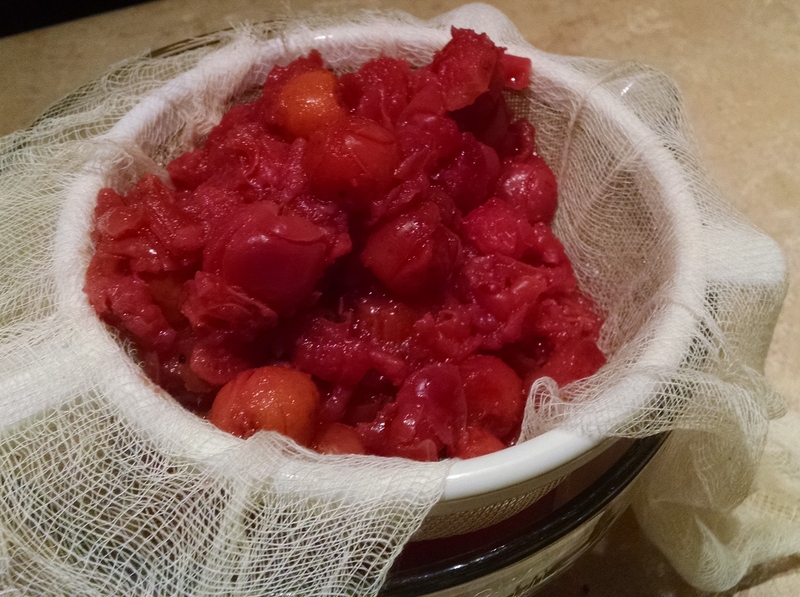 Crab apples are really, really tart so you won’t need pectin to make it gel. 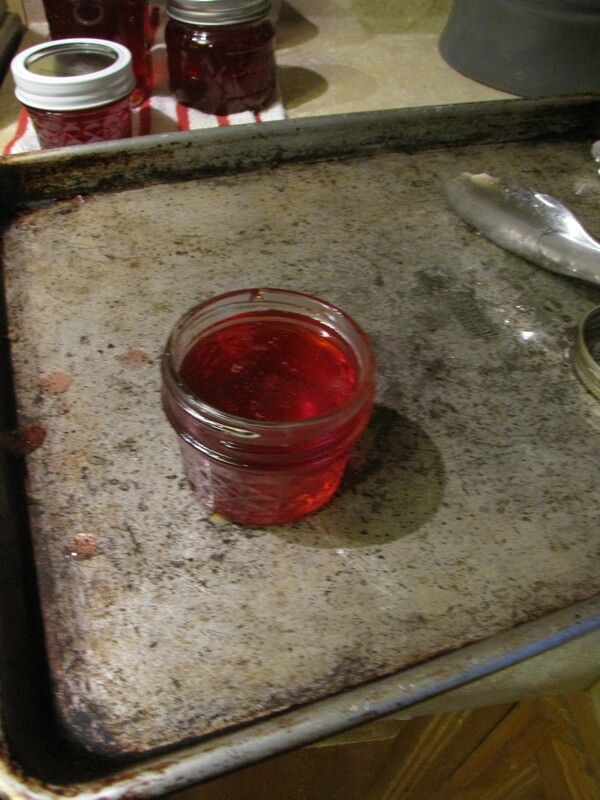 The other thing that I like about making jelly is that you just need to put the jelly in hot, sterilized jars. 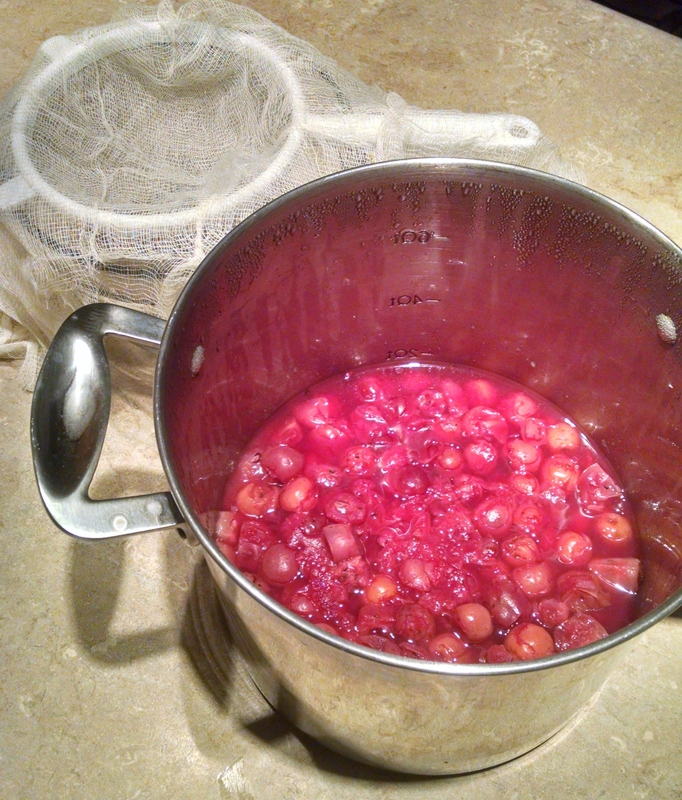 No need for hot water baths or other canning techniques. Skim the foam off as the crab apple juice/sugar mix gets up to temp. Tip: use a candy thermometer to get the jell temperature just right. 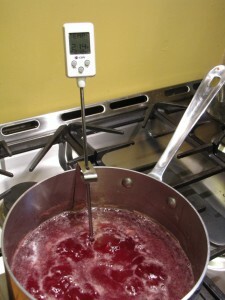 Water boils at 212F so you want to go for just slightly higher than that for your jelly. Notice the temperature is 214F. You can also use a spoon to check to make sure your jelly is ready. The jelly will ‘sheet’ and drops that come off the spoon will just hang off the edge of the spoon. Like this. 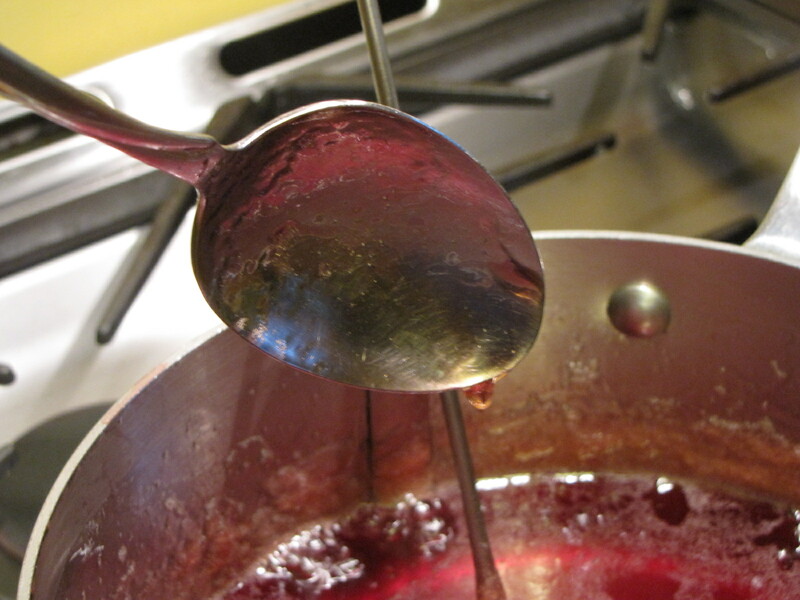 Once you’re sure your jelly is ready, ladle into hot jars. 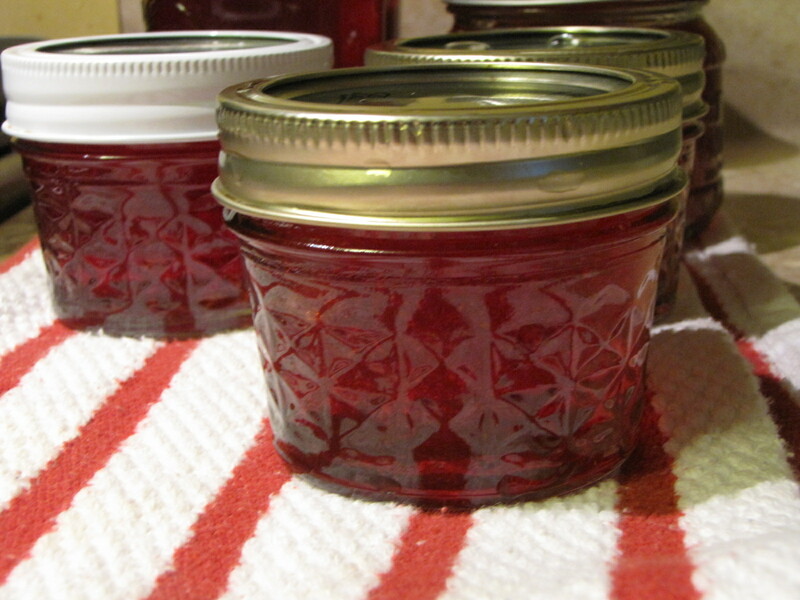 Top with lids and rings and just wait for that satisfying ‘thunk’ that happens when your jars seal. I hope you try making jelly. It’s really easy and so satisfying on toast – in the middle of winter – long after the memories of fresh fruit and warm weather months have passed. This post contains affiliate links. That means that if you click on one, I may receive a commission. 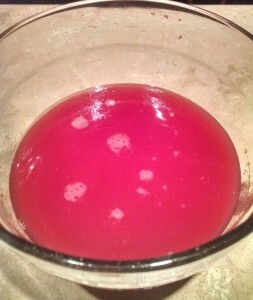 Oh how glorious does your crab apple jelly look. 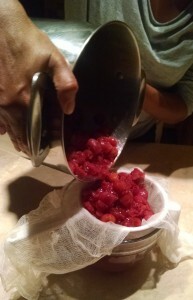 I’m a huge fan of jam making but have yet to venture into jelly making! Nothing beats homemade and your flavor in this jelly is perfect. I love making my own jams and jellies. This looks awesome. Crab apple is one that I’ve never made. Can’t wait to try it! Thanks for inspiration! This looks so delicious and easy! I will be putting this method to the test for our homeschool harvest week! Am so glad you’re going to give it a try! It really is easy. Be sure to taste your jelly to make sure it’s sweet enough. Crab apples can be REALLY tart! How long can these stay on the shelf and still! be safe to eat?